Care: Stainless steel surfaces should be cleaned and polished with a microfiber cloth, glass cleaner or other non abrasive and gentle cleaning agents. Lacquered surfaces should be cleaned with a moist cloth. Rubber parts should be cleaned with a moist cloth. Apply silicone spray for better finish. Vipp products with dark surfaces should be cleaned with a soft brush and, if stained, with a bit of water. Then wipe with dry cloth. A cleaning-friendly steel lid, spacious volume and a washable, food-safe approved inner liner are some of the product features of the Vipp breadbox – a functional way in which to store bread. 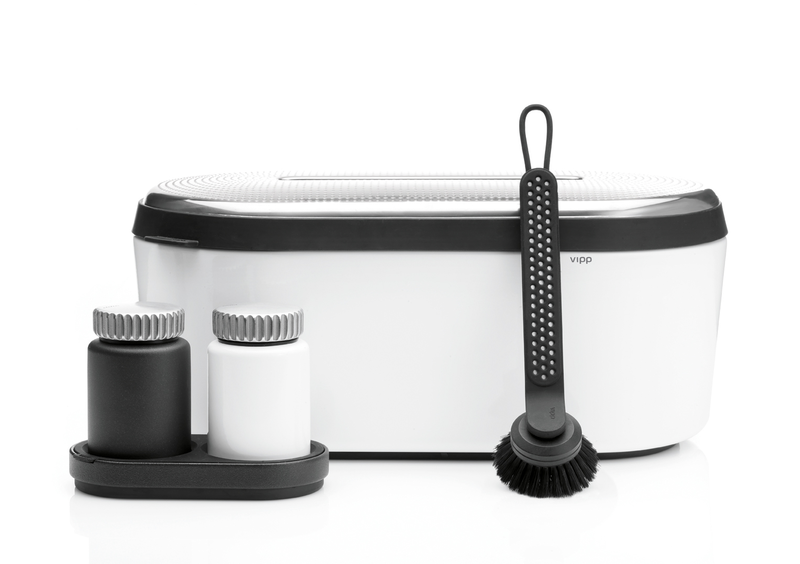 The Vipp breadbox is part of the 'Vipp Kitchen Tools' collection, comprising a series of solid tools for the kitchen which, as the home's workshop, places great demands on functionality and quality. "The stainless steel lid goes through a number of advanced manufacturing processes before it gets its characteristic dome form and approx. 2,400 punctuated ridges – this is an example of not necessarily choosing the easiest and cheapest path to the goal if we can see that it adds something unique to the product" - Morten Bo Jensen, Chief Designer at Vipp. 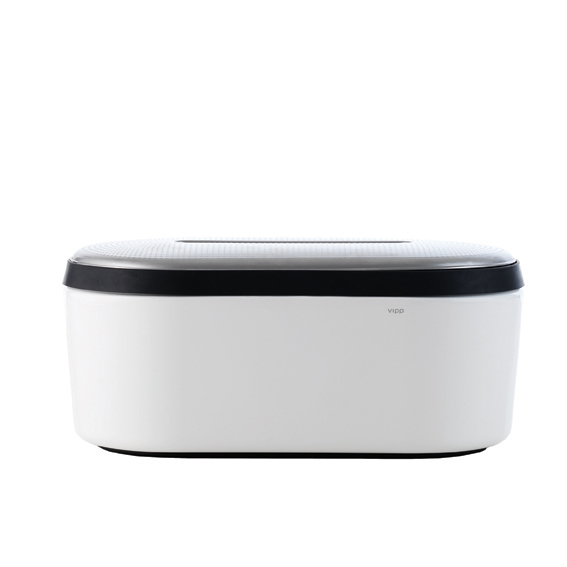 With its construction in stainless and powder-coated steel, rubber and a 100% cotton liner, the Vipp breadbox matches the rest of the product family. The liner is fitted on a rubber ring for optimal insulation and easy cleaning, which together with the small ventilation holes ensure optimal storage of bread products. The lid in brushed steel is equipped with a rubber handle. The rubber ring at the base protects surfaces just as the ridges inside the base of the box ensure ventilation under the bread. The kinship in the Vipp collection is unmistakable; new as well as old products enhance Vipp’s more than 70-year-old tradition for design products in excellent quality. The foundation of Vipp’s Design DNA derives from the classic pedal bin and is carried on by Vipp’s Chief Designer, Morten Bo Jensen: "Functionality and a distinctive idiom based on high quality materials and special manufacturing processes are the pillars of Vipp DNA and represents the common thread between past, present and future products." explains Morten Bo, Chief Designer in Vipp. Morten Bo Jensen is the creative mind behind recent years' new Vipp products. At the rather tender age of 27, Morten Bo was entrusted to carry on the Vipp family's design legacy. Educated as an industrial designer in Denmark and with a past working for the Biomega Bike brand, Morten Bo took on the challenge of bringing the 70-year-old Vipp design DNA into the future. From the company’s headquarters in Copenhagen, Morten Bo runs Vipp Design Lab that continuously seeks to combine aesthetics and functionality in order to reach new dimensions.